How does a project of this magnitude start? The story of the Me 262 Production Project really begins with the late President of Classic Fighter Industries, Stephen L. Snyder. Snyder was a master aviator, an accomplished aeronautical engineer, an inventor, an industrialist of distinction and a world record-holding skydiver who dedicated his entire life to aviation. Having developed an appreciation for Messerschmitt's jet fighter in childhood, Snyder set out to do something that others could only dream about: build accurate, flight-worthy examples of the 262. He began to seriously consider how such a thing might actually be done, and ultimately formed Classic Fighter Industries, Inc. with this project in mind. It then became a simple matter of waiting until the time, place, and circumstances were right to begin. From the beginning, there was little interest in creating a plane that only looked like a Me 262; the objective was to create precision duplicates of the jet. There were significant technical challenges to overcome: surviving airframes were rare indeed and technical drawings were incomplete -- not to mention scattered across two continents. Without a master pattern to follow, it simply could not be done. What was desperately needed was an original Me 262 that could be torn apart, analyzed, and duplicated, piece by piece. Nothing less would work. Could such a plane be found? The ideal candidate aircraft was found in an unlikely setting: a solitary example of an un-restored and original Me 262 was sitting outside of Willow Grove Naval Air Station in eastern Pennsylvania. The aircraft, once known as "White 35," was a rare Luftwaffe trainer, complete with dual-controls. Having spent decades on outdoor display, the jet was deteriorating rapidly. Unless it could be properly restored, its days were clearly numbered. This made it the single best hope for use in a restoration/reproduction project. It was soon discovered that the U.S. Navy owned the aircraft, but lacked the resources to give the old B-1a a quality restoration. Recognizing the possibilities, Snyder entered into a two year negotiation process with the Navy. The Navy was offered an attractive proposal: permit the old warbird to be dismantled and used as a template, and they would get back a fully restored aircraft at no cost to the government. The Navy accepted the deal, and the search for a suitable fabricator was mounted. Originally, plans called for subcontracting all new aircraft construction to a private group in Germany; however, a requirement to keep the "reference aircraft" owned by the U.S. Navy within the U.S. forced Snyder to find an alternate contractor. After a review of several potential restoration groups, Snyder contacted the Texas Airplane Factory (TAF) in Fort Worth. 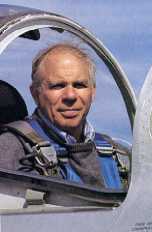 The expertise needed to build the jets was found in Herbert Tischler, TAF's owner. Tischler quickly agreed to take on the project, submitted formal cost estimates and began setting up a production timetable. With TAF on line as the prime initial subcontractor, construction began on July 1, 1993. � 2001 Sabre Design Group. All rights reserved.